Get fuller-looking lips in one easy stroke with these They're Real! 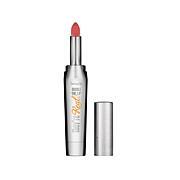 Lipsticks and Liners in One from Benefit Cosmetics. A custom teardrop applicator grabs and defines your lip line and fills in lips with complementing color for the appearance of volume and dimension. In an instrumental test on 20 panelists who used Benefit Cosmetics They're Real! 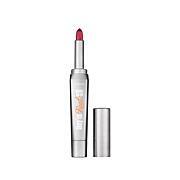 Double the Lip Lipstick & Liner in One, color was found to stay on for up to 8 hours. They're Real! 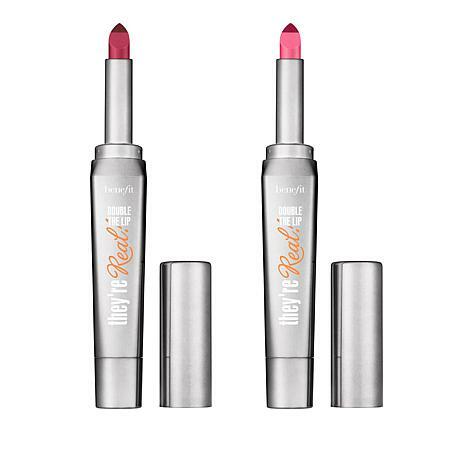 Double the Lip Lipstick & Liner in One - Juicy Berry .05 oz. They're Real! Double the Lip Lipstick & Liner in One - Pink Thrills .05 oz. Ingredients: Diisostearyl Malate, Phenyl Trimethicone, Octyldodecanol, Caprylic/Capric Triglyceride, Lanolin Oil, Euphorbia Cerifera (Candelilla) Wax, Silica, Cera Microcristallina (Microcrystalline Wax), Paraffin, Polyethylene, Isostearyl Alcohol, Bis-Diglyceryl Polyacyladipate-2, Hydrogenated Polydecene, Cetearyl Alcohol, Phenoxyethanol, Parfum (Fragrance), Sorbitan Oleate, Limonene, Linalool, Benzyl Salicylate, Hydroxycitronellal, Benzyl Alcohol, BHT, Tocopherol. [+/-: CI 12085 (Red 36, Red 36 Lake), CI 15850 (Red 6, Red 7, Red 7 Lake), CI 15985 (Yellow 6, Yellow 6 Lake), CI 19140 (Yellow 5, Yellow 5 Lake), CI 42090 (Blue 1 Lake), CI 45380 (Red 21, Red 21 Lake, Red 22 Lake), CI 45410 (Red 27, Red 27 Lake, Red 28 Lake), CI 73360 (Red 30, Red 30 Lake), CI 77891 (Titanium Dioxide), CI 77163 (Bismuth Oxychloride), CI 77491, CI 77492, CI 77499 (Iron Oxides), CI 77742 (Manganese Violet)]. Ingredients: Diisostearyl Malate, Aluminum Starch Octenylsuccinate, Phenyl Trimethicone, Caprylic/Capric Triglyceride, Lanolin Oil, Euphorbia Cerifera (Candelilla) Wax, Octyldodecanol, Silica, Cera Microcristallina (Microcrystalline Wax), Paraffin, Polyethylene, Isostearyl Alcohol, Bis-Diglyceryl Polyacyladipate-2, Hydrogenated Polydecene, Cetearyl Alcohol, Phenoxyethanol, Parfum (Fragrance), Sorbitan Oleate, Limonene, Linalool, Benzyl Salicylate, Hydroxycitronellal, Benzyl Alcohol, BHT, Tocopherol. [+/-: CI 12085 (Red 36, Red 36 Lake), CI 15850 (Red 6, Red 7, Red 7 Lake), CI 15985 (Yellow 6, Yellow 6 Lake), CI 19140 (Yellow 5, Yellow 5 Lake), CI 42090 (Blue 1 Lake), CI 45380 (Red 21, Red 21 Lake, Red 22 Lake), CI 45410 (Red 27, Red 27 Lake, Red 28 Lake), CI 73360 (Red 30, Red 30 Lake), CI 77891 (Titanium Dioxide), CI 77163 (Bismuth Oxychloride), CI 77491, CI 77492, CI 77499 (Iron Oxides), CI 77742 (Manganese Violet)]. OMG These are awesome. They stay on all day, they do not flack or dry out my lips. I can't wait to try all of the colors. I didnt care for it , I normally use Matt lipsticks, and it was to creamy for my taste.